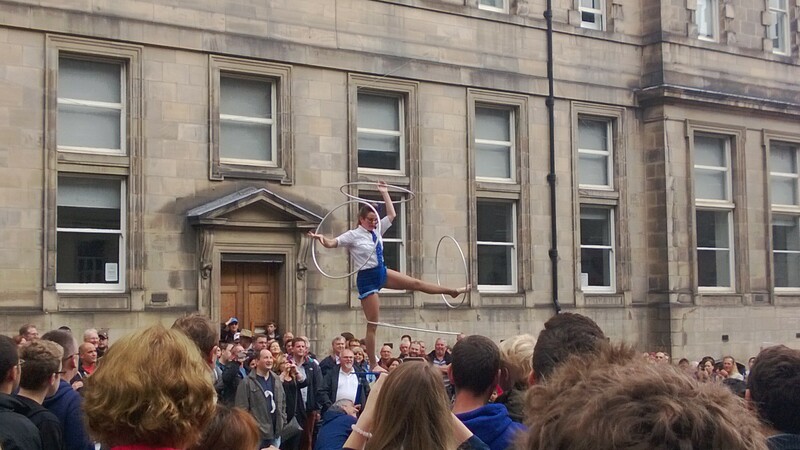 A circus performer on the Royal Mile during Ed Fringe. I’ve wanted to go to the Edinburgh Festival Fringe for several years to become a better artist and producer. I also wanted to raise Elephant Run District’s profile. The Fringe is the Olympics of culture and I’ve wanted to experience what that was like. 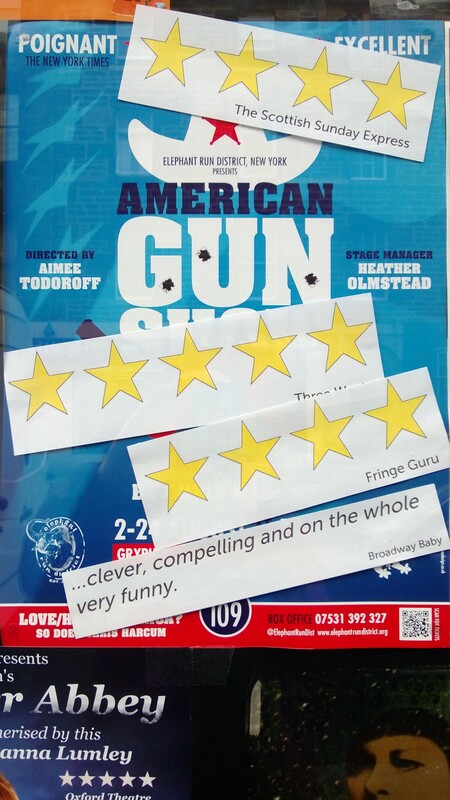 The piece we took over was a solo show called American Gun Show, a challenging and controversial piece. A thinking person’s comedy. How much thinking and how much laughing depended on each individual audience member. Some people hate that kind of thing. Others love it. The task is to find more of the latter and less of the former. 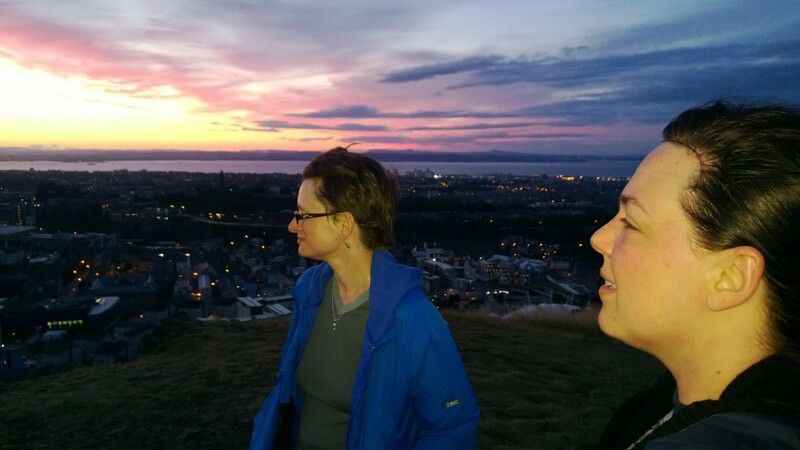 ERD’s stage manager Heather Olmstead and director Aimee Todoroff enjoying the view from atop Arthur’s Seat. Our main goal was to carve a unique place in Edinburgh. We accomplished that well above our expectations. We hope over time to get our work to other places in Europe and the UK. (It would be so cool to perform in London, Germany, or parts of Ireland.) While nothing tangible happened with this piece on this go round to make those dreams happen, we expect that will change with future visits there. You may have a great reputation where you live but you have to prove yourself in Edinburgh to separate yourself from the crowd. I was told by our press agent that the average audience size per performance for theater is 3.5 patrons. I’ve heard it is 6 patrons overall for the other categories, including comedy. You might ask, “How is that possible?” Well, in 2013 there were 2,871 productions, with 454,464 performances in 273 venues. There was an estimated 1,943,493 tickets sold by the final Monday of the three weeks with another day of sales to go. It is the largest arts festival in the world. It can be overwhelming so it’s important to schedule time to walk up Arthur’s Seat. 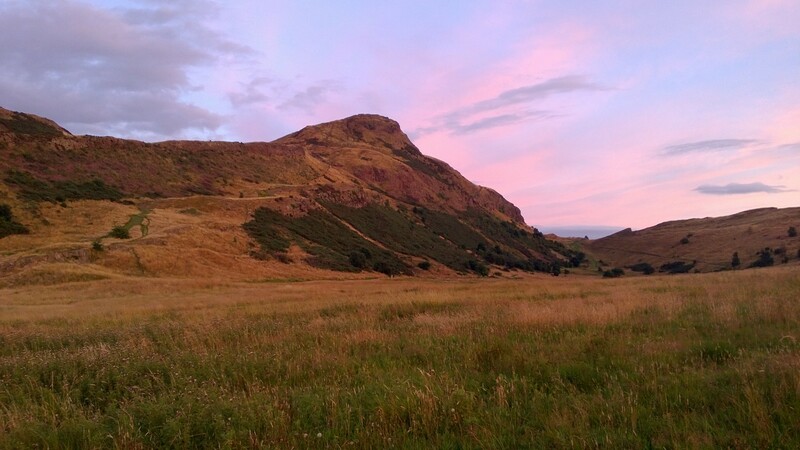 Arthur’s Seat. Click to see this full size. Going with a show to Edinburgh was a very full experience. While it was close to what I expected, things played out in ways I could never have anticipated. The highs were much higher and the lows were much lower. The amount of both is greater than most of the projects I have done combined. Ed Fringe is like flying a plane. You can ride in a plane and you can take classes on flying, but until you have the controls in your hands you can never know what it is really like. Lots of things can go right and many, many things can go wrong. Things you never would have thought about in a million years can suddenly become your main focus. You will more than likely spend way more money than you budgeted. You will not have enough time to see everything you will want to see. The zeitgeist of the festival changes year to year so you can’t count on what worked in the past for someone else. This cannot be emphasized enough: what may or may not have worked for someone else may or may not work for you. You can gather information to make more informed decisions but you will make mistakes and feel like you are failing horribly along the way. In the end, though, this is the path to success. Star ratings are important in Edinburgh. I’m slow to warm up to this idea. The reactions to our show covered the gamut. We knew we were taking something that would push some buttons but also delight and surprise people so we were happy with this. Our attendance was very good for our first time there (we averaged between 15 and 20 patrons most of the time) and we had eight reviews, most of which were very positive. The thing that took adjusting for me was that the reviews there are based on the number of stars. While some reviewers do that for movies in America, few do that for theater in New York. Only Time Out New York started doing that six or so years ago and I really do not pay attention to their star ratings. I guess with so many show happening in Edinburgh, the stars are helpful to know quickly what is good or not. To me, it cuts out the critical thinking and the deeper thoughts about the work. But I am happy we received reviews with lots of stars. Unfortunately, those reviews came towards the end of the festival and didn’t help us as much as I would have liked. 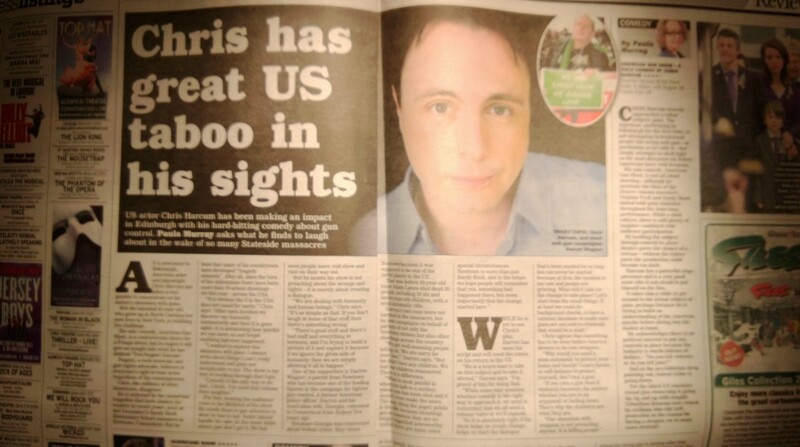 A review and feature came out in the Scottish Sunday Express, one of the country’s national papers. The lesson from this is that you really need to plan to go twice with a show. The first year is to build up a following and to rack up reviews. The second year is to reap what you have sown. (Again, results may vary.) They say it takes three visits to the festival for people to get to know you. To cash in on that “oh, I heard about that, I want to see that” momentum. This lesson seems to have worked well for Peter Michael Marino and his show Desperately Seeking the Exit. He had an uphill climb his first year but had people lining up for his show, with little effort his second year. I also heard stories of shows moving to more prominent venues to lesser reviews and fewer attendees. I also saw people who had received lots of acclaim and great audiences struggle with a different piece. It’s a risk each time. In my experiences with past productions, I could count on responses happening within a certain range. If people are generally liking a show, an off night won’t seem so bad. Maybe you miss a laugh here or there. Maybe there’s a little more fidgeting. Or if they don’t care for it too much in general (a real stinker), you will experience that through most of the run and are pleasantly surprised when an audience connects. Going to the theater each night, you have some idea of what you’ll get give or take 5 to 10%. We also had a couple walk out and shout throughout the lobby that I was a “gun-hating liberal.” We had people in tears and trembling after my show because they were so moved. We had people yell at us for calling the show a comedy and others say that was a brilliant choice because it surprised them in a good way. We had people talk to us for hours after the show trying to grapple on their feelings about the issue of gun violence. 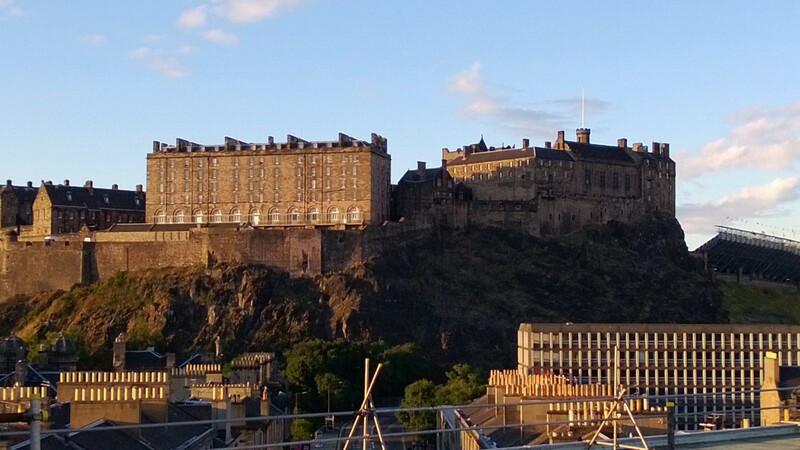 A view from the Sky Bar on the roof of the Point Hotel where the Gryphon Venues are located during Ed Fringe. 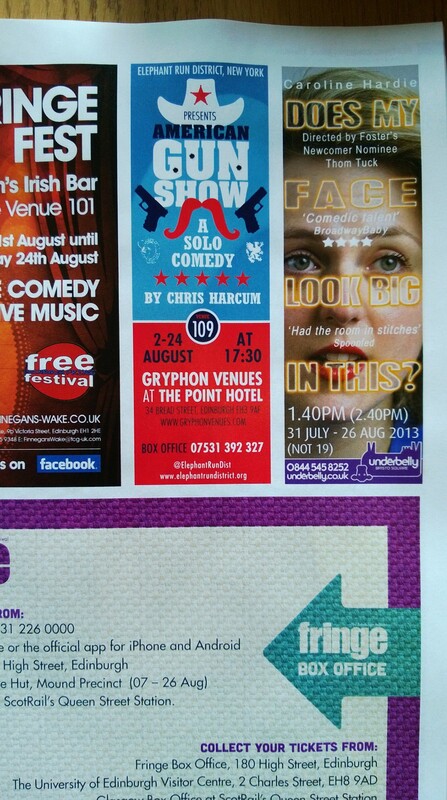 We worked with Gryphon Venues. They are located on Bread Street not far from the Traverse and are in the Point Hotel. (Note: This might go through a name change as the Doubletree is taking over.) I met the Artistic Director Kekoa Kaluhiokalani at the road show in New York. I liked the fact that Gryphon Venues are a nonprofit group and asked for a flat fee up front rather than a box office split with a guarantee because I knew what we would be spending. From my application through to my final pay-out with them, they were professional, kind, supportive, capable, and nice. A great venue, with an incredible staff. 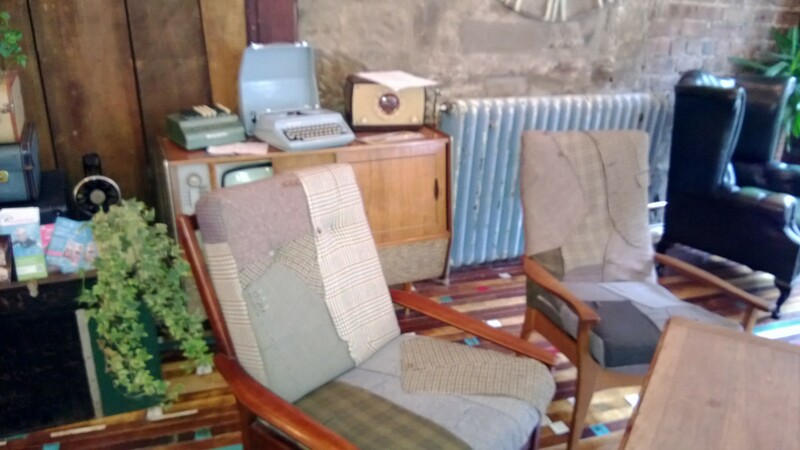 Their spaces are really some of the best in the Fringe. They feel like legitimate theater spaces, which is what we wanted for this show. Honestly, I liked the physical set-up of their spaces better than most of the spaces for the big four presenting organizations. They use a couple of the event rooms at the hotel and turn them into a nice proscenium and a charming black box. Their storage spaces are nice and their lobby is spacious. The lighting and sound were excellent. They give a full fifteen minutes to get in and get out. Overall, they gave me a feeling of confidence I don’t think I’d have a lot of other places. The only real downside is that they are a little isolated where they are so you don’t have as much foot traffic, but several shows frequently sold out there. I loved the folks at the Gryphon and can’t recommend them enough. Very tiny but very expensive ad in the local press. Not 100% sure it was worth the $$$. We spent a lot more money than expected but that is part of the education of going there the first time. The accommodations were very pricey—more than double my monthly rent in Manhattan! !—and we spent twice as much as expected on advertising. We hired a publicist; bought an ad in the Fringe guide; got a second ad in a magazine; and online ads on Fringe Guru, Broadway Baby, and the List’s websites. We paid for distribution of our posters and flyers before we arrived. We only saw a couple of our posters around town and didn’t see our flyers in enough places so we won’t do that again. We had to order another round of flyers and hired a person to flyer. He was excellent and we will use him again next time, if he’s available. From my talks with people after the show, most were drawn by our flyer, by our flyering guy, or by the listing in the main Fringe guide. 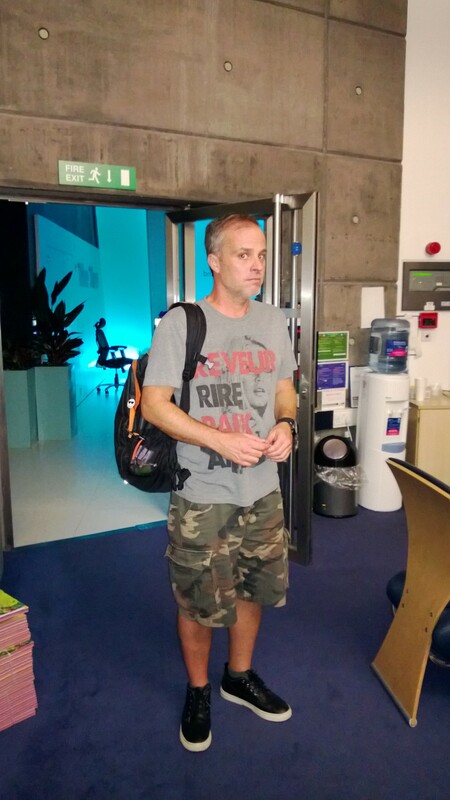 Fellow American performer and good friend Peter Michael Marino in the lobby of the BBC Scotland radio station before we interviewed with someone over headphones with a journalist somewhere in Great Britain. Our press agent did get me radio interviews on BBC Scotland and Fresh Air U.K. Both were incredible experiences. You have to take care of yourself there or you will suffer or get sick. I had a flu through most of the festival. I was staying a block from my venue so I found it nice to go to FYUL and Espresso Mondo to have an Americano and read the papers. I had given up coffee ten months prior to going to Edinburgh but had to have a bit of caffeine to make it through the festival. I’m an aggressive performer but an introvert by nature so it is necessary for me to unwind and have time to myself. New Yorkers tend to steer clear of Times Square and other congested areas so I did the same when I was in Edinburgh. After a couple of days, I found the back roads to the main areas. 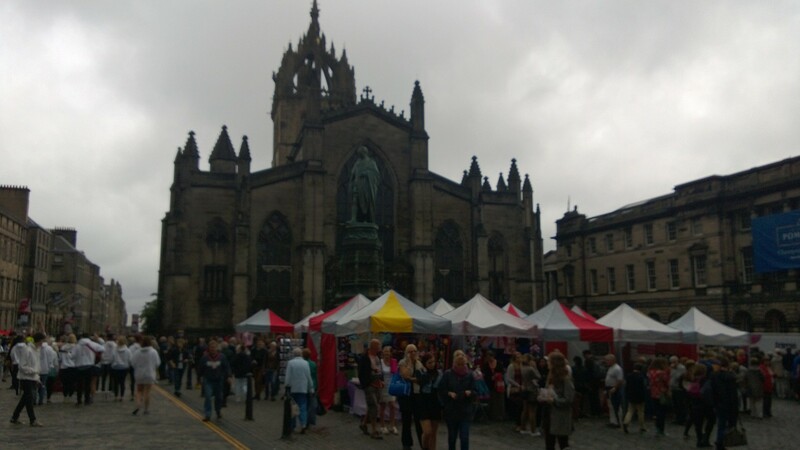 I went to the Royal Mile a few times but was rather unhappy there. I found back ways to get to Fringe Central and spent a lot of time on Lothian Road and areas north of Princess Street. I wanted to forget the festival was happening at times. It is a long three (plus) weeks. I got to my first day off, which happened about ten days into the festival, and thought, “Whew, I’m glad that’s done.” Then I realized I had half the festival to go. I’ve done long runs of shows and I’ve done many festivals but most festivals only consist of 5 or 6 performances. The adrenaline going that long was new to me. It never really stopped. I had shiatsu a couple of times at the Healthy Life Centre. Inside FYUL, a coffee shop a couple door’s down from Gryphon Venues. A nice place to find some calm between many storms. The decision to do the Edinburgh Festival Fringe should be made no later than eight months out. I also recommend doing your show at a few different festivals in diverse places to get an assortment of reactions. 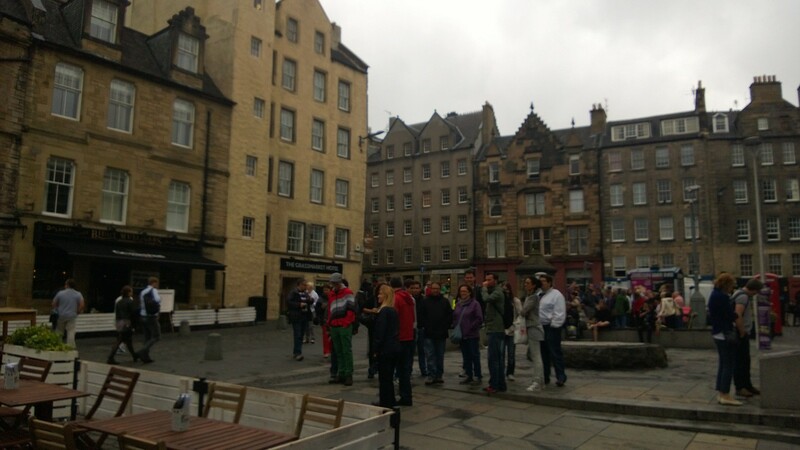 Obligatory picture of people swarming on the Royal Mile. “Suicide Wednesday” happens in the middle of Week One. There’s Week Zero. That’s the week when most people tech their shows and give away a lot of tickets. Then on the Monday and Tuesday of Week One nearly everyone does 2-for-1 tickets. The day after that is when no one goes to see anything. That’s the day my press agent came to my show. She was one of four people in that audience. It was weird. I wanted to slit my wrists. Hence the name of that day. It cost much less to withdraw money from an ATM than exchanging it before going over. I belong to Actors’ Federal Credit Union and the fee for each withdrawal was only 75 cents. I learned to not bring back pound or Euro coins. You can’t exchange coins, only paper money. So now I’m forced to go back to Edinburgh to use up this little bag of coins. The town was easy to navigate once you learn a few misleading things such as George Square vs. George Street and Assembly Hall vs. Assembly Rooms. 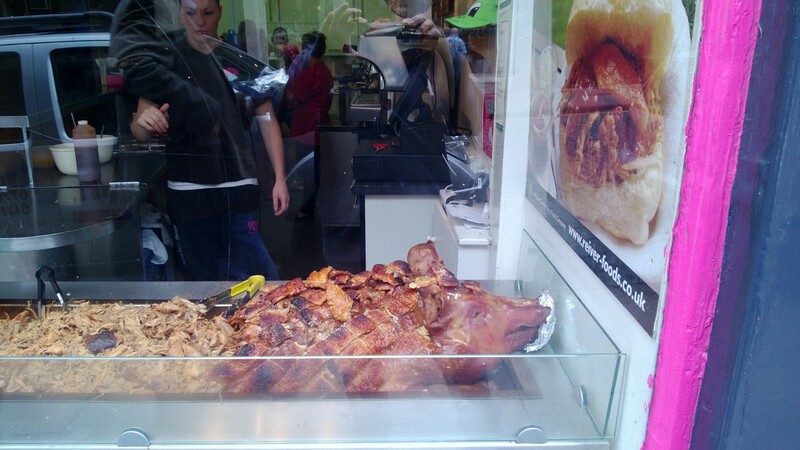 An actual pig in an actual shop called Oink, located off the Grassmarket. Bacon and pork are main ingredients there. I became a vegetarian this year so the amount of bacon and pork product in everything stood out to me. I could not wrap my head (or mouth) around mayonnaise on pizza. Chips n’ cheese is amazing. It’s French fries, with garlic mayo and melted cheese. If you drink too many whiskeys (don’t call it Scotch there), chips n’ cheese will fix you right up. Vegetarian haggis is surprisingly good. And even better in a burrito. If I could afford it, I’d buy a place there. It’s a beautiful city. Edinburgh’s Grassmarket area. It feels like my nabe away from my nabe.